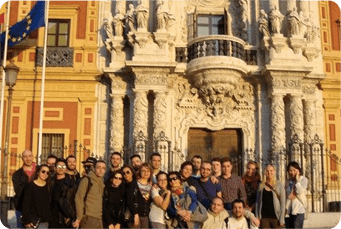 In addition to our Spanish courses, at IELE want to make our student feel at home by offering services to facilitate their stay in Seville. Seville and Andalusia have a lot to offer and IELE would like to help you discover and enjoy it all. There are 2 types of activities. -Weekly cultural exchange parties. An absolute must to meet people from all over the world! 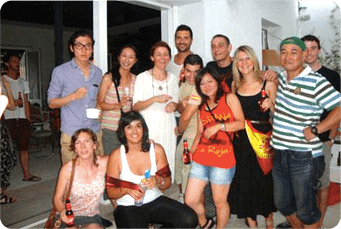 -“Intercambios”: Language exchange meetings with Spaniards ,that give you the chance to practice your Spanish with them for part of the time and for them to converse with you in English (or your native language) the other part. -Library: Free advice and loaning of books, movies, and publications in Spanish. These activities range from an hour-long (for example a guitar class) to a weekend trip. Your participation depends on your tastes and available free time. Payment ahead of time is required. 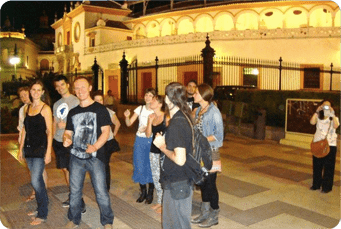 Examples include: Flamenco at a tablao, bullfights, bike tours, river cruises on the Guadalquivir, excursions to Cordoba, Granada, Morocco, Portugal, excursions to the beach, and/or gastronomy courses! If you prefer to travel independently our staff will be glad to help you plan your trip. You will receive expert advice for free about where to go, how to get there, car rentals, and accommodations. Seville and its surrounding countryside and pueblos offer many opportunities to be active. The beach is less than an hour away!